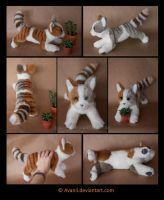 A 15 cm standing plushie for Savkate of her fluffy cat Indy! Plush 1 of 2 as part of the April batch, completed in July. Indy is made of silky faux furs and minky. 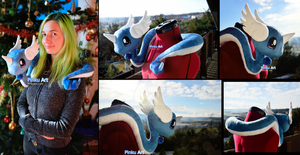 The plush is based on my Beanie pattern, but enlarged a little to allow me to use faux fur for the body! Indy has pale yellow safety eyes and an embroidered nose and mouth. The tail is wired, the stripes are painted on with Copic markers and acrylic paints. The fluffy fur has a peculiar dusty grey colour, which my camera apparently struggled to capture!